A salon incorporating the best of American and Japanese skin remedies procedures. The owner, a chief esthetician has a fully licensed C.I.D.E.S.C.O diploma, as well as years of international experience. Utilizing knowledge and experience of the best skin remedy practices from Japan and the U.S, Kumiko is well equipped to treat any aliments within a warm and friendly environment. and hidden extras of other establishments as well as the freedom of a pay-as-you-go payment system. The chief esthetician's objective is to ensure her clientele achieves the most beautiful skin via treatment of both the mind and body. The first stage of treatment requires extensive consultation to find the root cause of the problem, particularly focusing on lifestyle, stress, diet or affects of existing skin treatments. Once the source of the ailment is isolated then the chief esthetician will advise on the appropriate adjustments to the above. All treatment are customized and personalized for the client’s optimal treatment and the best remedies will be selected from many products, several machines and hand technique. What kind of license does she have? What kind of place is Peacherino? The Peacherino environment can be considered a sanctuary from the outside world. A decor of rich earthly color encourages a calming, stress-free ambiance. Peacherino is also an English-friendly environment. 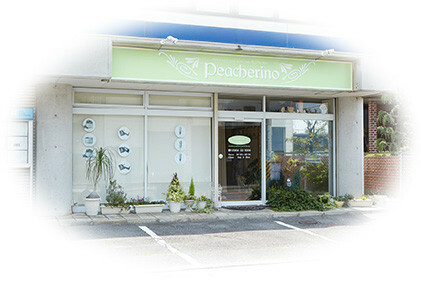 Peacherino's popularity and reputation is most evident when you consider that the regular clientele is loyal and expands beyond the borders of Aichi prefecture. What benefits can I expect from the treatments? all products are non-comedogenic and contain no occlusive mineral oil or lanolin, no irritating artificial colors or fragrance, and no drying S.D alcohol. Most of the products which contain the botanical essential oil are used in the course of treatment to give you a relaxing & healing experience. Peacherino also focuses on body work, incorporating various massage techniques for the face and body based on Swedish massage and original techniques developed through Kumiko’s long experience. More thorough techniques involve lymphatic drainage and the application of heat mat to achieve deeper and longer-lasting results. All of this is provided in a safe and relaxed environment meant to enhance a meditative and peaceful state. Peacherino have an after treatment care system to answer any question or concerns regarding the treatments you have received. Peacherino also offers gift certificates, an ideal gift for a loved one or those you care about! All enquiries are welcome, today. We hope to hear from you! Please feel free to contact us by e-mail or LINE anytime. Copyright (C) 2016 Peacherino. All Rights Reserved.